Note, Andrew Wallace's 8th grade project says that the name of Andrew Young's father was Alexander, born 1829, not John, born 1812. He has Alexander's father named John Young, born 1811, married to Jane Crawford. This is not what the census and birth records say. Because the marriage date to Jane Crawford is after the birth of Elizabeth, I assume there was an earlier wife who was the mother of Elizabeth. 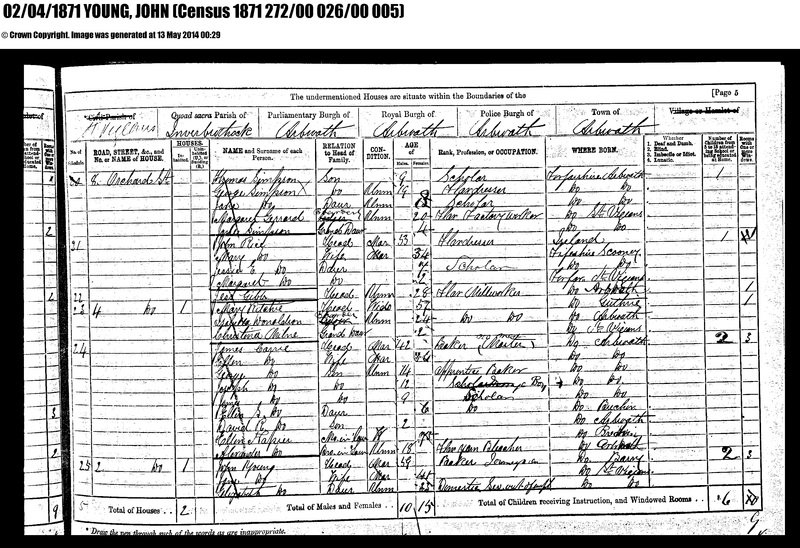 Found a marriage record to Margaret Ritchie; Andrew Wallace's project said John Young was married to Margaret Ritchie; and there was a Mary Ritchie, widow, age 57, born Forfarshire, Guthrie, living next door to John & Jane Young in the 1871 census. John Young 59 - head, Baker Journeyman, born Farforshire,Barry? 1881 Census 6 Stobcross Lane, Arbroath, Civil Parish: St Vigeans, County Angus. August 11, 1883, Arbroath. John Young, 72, journeryman, married to 1. Margaret Ritchie and 2. Jane Crawford. 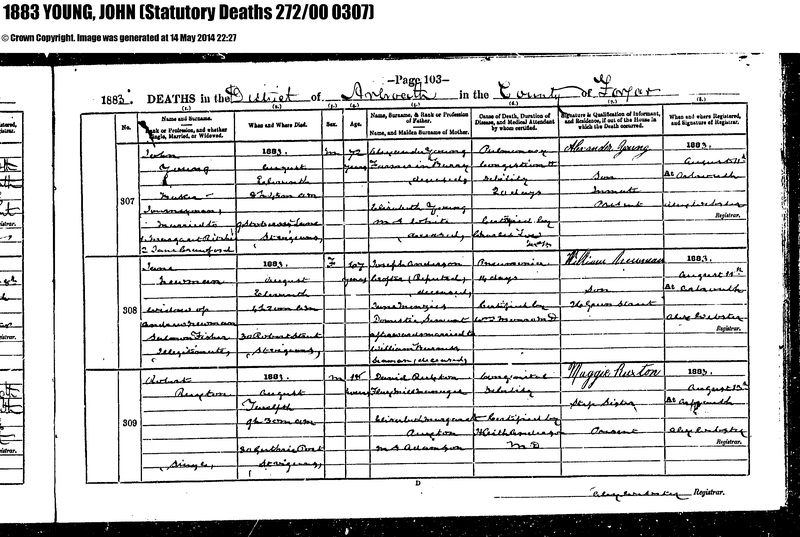 Father, Alexander Young, Barry, Forfarshire, deceased. Mother, Elizabeth Young, nee White, deceased. Died of pulmonary congestion and debility after a 20 day illness. Informant was Alexander Young, son, resident of Arbroath. Andrew Wallace's 8th grade project shows John Young married to Margaret Ritchie. Found a birth record for James Young, parents John Young and Margaret Richie, 1840. Flax spinner in 1851 census. 1851 Census- two Elisabeths in the family, one was 13, an errand girl, so birth would be about 1838. Second Elisabeth, age 1 months, birth about 1851. Don't know which Elizabeth was the one who was still with the famiy in the 1871 census; probably the younger one. Scholar in 1851 census. Transcript said name was Jeun, but it looks like Jean to me. Odd that two girls in the family had the name Elisabeth. I wonder if the older Elisabeth died before 1851?